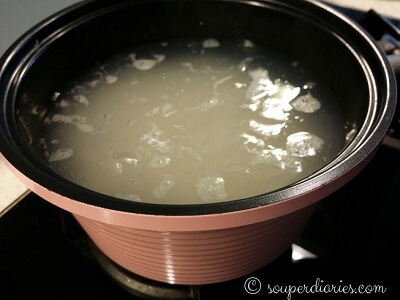 I used to boil sago together with my tong sui until I discovered the correct way to do it was to boil it separately. Sago is essentially extracted starch from the centre of sago palm tree stems. So if it is boiled together with your dessert it would cause the liquid to turn starchy and cloudy. Sago pearls look similar to tapioca pearls but tapioca pearls are made from the root of cassava trees. The texture is also different. 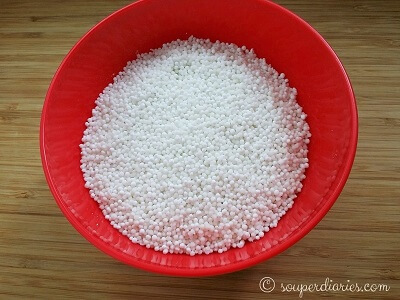 Sago pearls are soft and more delicate whereas tapioca pearls are denser, chewy and commonly used in bubble tea drinks. Below is a pictorial guide on preparing sago pearls. This is the sago that I’m cooking today. I used the small sago. You can find these and bigger sago from Asian dried goods shop or the Asian section of your local supermarket. 1. Bring a small pot of water to a boil. I used my Happycall alumite ceramic pot. Read the review here. Pour in sago seeds and lower heat. Let it simmer for around 10 minutes. Stir gently occasionally to prevent the sago pearls from clumping and sticking to the pot. 2. After 5 minutes of simmering. Notice that the water has turned slightly cloudy. Keep stirring gently. 3. After 10 minutes of simmering, turn off the heat. The water has turned all starchy now caused by the starch from the sago seeds. You will see that the sago still has a tiny white dot in the middle. The sago is not fully cooked yet. 4. Keep the pot covered for about 5-10 minutes and let the remaining heat finish cooking the sago. After 10 minutes, open the lid and check. It is fully cooked when the sago is all translucent and has no white in center. 5. 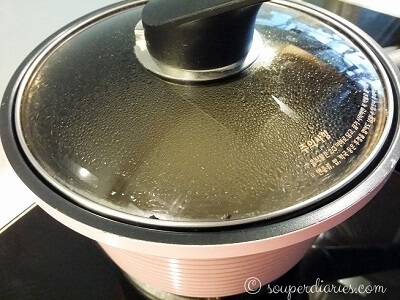 Remove cooked sago from the pot. Strain and rinse them under cold running water a few times to remove any residual starch. 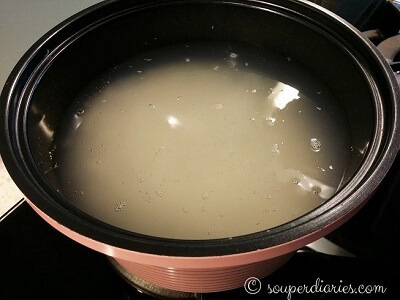 Keep freshly cooked sago in enough water to cover it until ready to use. Best to use it within 2 to 3 days. Spoon some of these delicate orbs into your favourite dessert for added texture. I like to add them in classic Chinese desserts such as Green Bean Soup and Red Bean Soup. Enjoy! 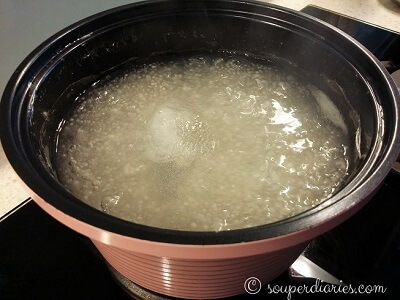 Pictorial guide on how to cook sago. Bring a small pot of water to a boil. Pour in sago seeds and lower heat. Let it simmer for around 10 minutes. Stir gently occasionally to prevent the sago pearls from clumping and sticking to the pot. After 10 minutes of simmering, turn off the heat. The water has turned all starchy now caused by the starch from the sago seeds. You will see that the sago still has a tiny white dot in the middle. The sago is not fully cooked yet. Keep the pot covered for about 5-10 minutes and let the remaining heat finish cooking the sago. After 10 minutes, open the lid and check. It is fully cooked when the sago is all translucent and has no white in center. 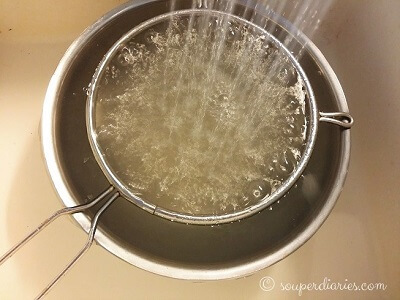 Strain and rinse the sago under cold running water a few times to remove any residual starch. Keep freshly cooked sago in enough water to cover it until ready to use. Best to use within a few days. Nice recipe, and great visuals. I’m a visual-learner, and normally can’t stand it when recipes are confusing and don’t have any pictures to accompany. 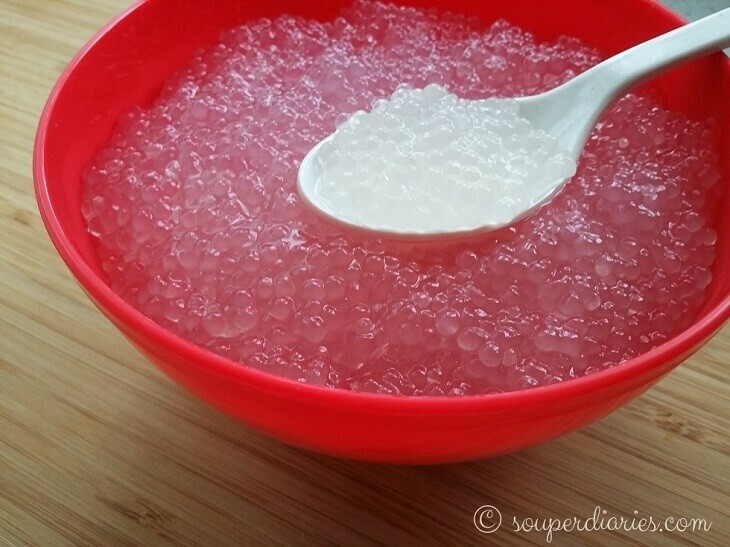 As for sago, growing up with a FIlipino family, I grew up eating sago. I often drank them in a shake as well, when I visited Manila there were various stalls that sold sago shakes. You can also find ’em in Chinese places across the US. Awesome site. You recipe and directions were very easy to follow. The pictures were spot on with What i needed to do. I wish that the approximate prices for each individual Ingredient and the price as a whole were somewhere on here. but next time i need to cook soup this is where i’m going.